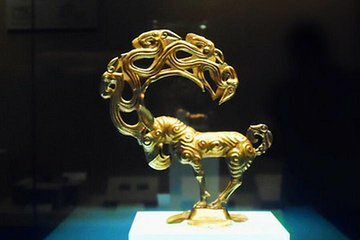 Há muito mais em Xian, uma das grandes capitais históricas da China, do que o Museu de Guerreiros e Cavalos de Terracota. Não se apresse. Este tour privado de 2 dias, completo com passagens de avião, hotel, almoço e entrada, cobre todos os pontos altos, poupando-lhe as dificuldades do planejamento do itinerário. O dia 1 abrange o Museu de História de Shaanxi, o Big Wild Goose Pagoda e o Muslim Quarter; no dia 2, veja os guerreiros e a Muralha da Cidade de Xian. Our experience was overwhelmingly positive. From the pick up at our Bejing hotel to the drop off at our Bejing hotel. Our drivers all went above and beyond their duties. Our tour guide, Mary, made a suggestion to add to our tour the day before by email. On our way to Xi'an from the airport there was a fascinating museum, we were glad she suggested it. We decided last minute to attend a show the night we where in Xi'an and our driver very willingly added to his long day. Our accommodations were comfortable and right in the middle of old Xi'an. That allowed us to walk around at night and admire all the bright lights and decorations. The next day we had breakfast at the hotel included in our package. Than were picked up and off we went for a full day. Our guide was accommodating to our group, we had a young child and a shutterbug. Both tend to slow you down. She made adjustments where needed so we could still enjoy each location. Our tour guide also handled all the questions, which I have to say was a lot!. She was very informative and understanding of our ignorance of the culture. If there is anything negative we could say it would be the food, which is included. The first day we were taken to very touristy places that had a mix of western and Chinese food. Not very good. The second day we asked her to please take us somewhere more authentic and she did. She also made recommendations of dishes that the Xi'an area is known for, yummy noodles. Our lunch was amazing, we were at a restaurant in the town near the Terra cotta soldiers. Sorry I cant remember the name. We were glad we booked a tour that took care of all the transportation since we are not from a large city, nor do we speak the language. Having the tour guide there to help us with purchases and the driver to get us safely to each spot was very comforting. Both days were filled with many wonderful sights, Xi'an is beautiful and has many friendly people living there. We were there March 2018.